Hardcover, 10 x 11 in. / 176 pgs / 130 bw. What happens if you shoot a whole movie in a single frame? "I wanted to photograph a movie, with all its appearance of life and motion, in order to stop it again.... My dream was to capture 170,000 photographs on a single frame of film. 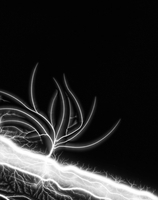 The image I had inside my brain was of a gleaming white screen inside a dark movie theater. 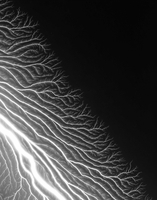 The light created by an excess of 170,000 exposures would be the embodiment or manifestation of something awe-inspiring and divine." 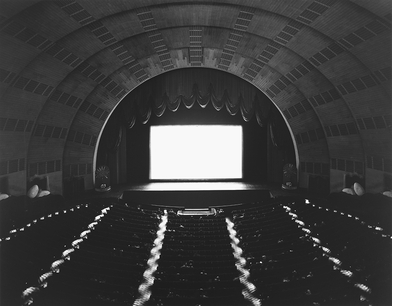 In the late 1970s, as Hiroshi Sugimoto was defining his artistic voice, he posed a question to himself: “Suppose you shoot a whole movie in a single frame?” The answer that came to him: “You get a shining screen.” For almost four decades, Sugimoto has been photographing the interiors of theaters using a large-format camera and no lighting other than the projection of the running movie. He opens the aperture when a film begins and closes it when it ends. In the resulting images, the screen becomes a luminous white box and the ambient light subtly brings forward the rich architectural details of these spaces. 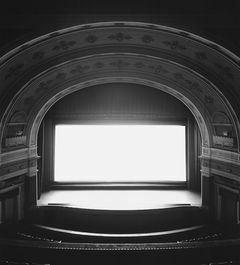 Sugimoto began by photographing the classic movie palaces built in the 1920s and ‘30s, their ornate architectural elements a testament to the cultural importance of the burgeoning movie industry. He continued the series with drive-in theaters. 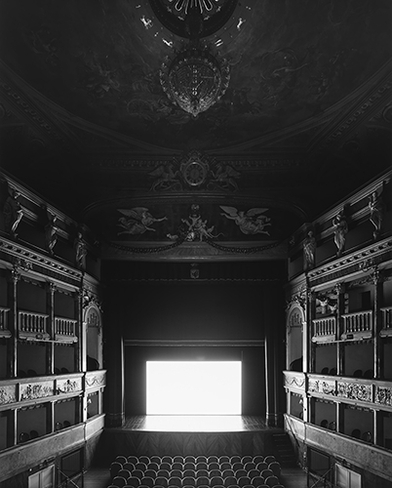 In the last decade, Sugimoto has photographed historic theaters in Europe as well as disused theaters that show the ravages of time. 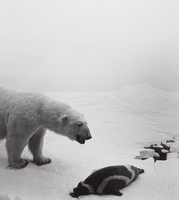 Taken together, these photographs present an extended meditation on the passage of time, a recurring theme in his artwork. 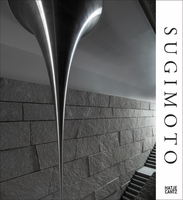 Theaters, the third in a series of books on Sugimoto’s art, presents 130 photographs, 21 of which have never before been published. Hiroshi Sugimoto (born 1948) has exhibited extensively in major museums and galleries throughout the world, and his work is held in numerous public collections, including The Metropolitan Museum of Art, New York; Museum of Contemporary Art, Tokyo; National Gallery, London; National Museum of Modern Art, Tokyo; Smithsonian, Washington, DC; and Tate, London, among others. 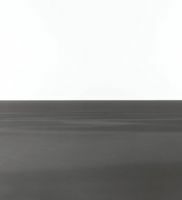 Sugimoto divides his time between Tokyo and New York City. 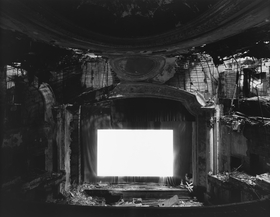 "Paramont Theater, Newark, 2015" is reproduced from Hiroshi Sugimoto: Theaters. 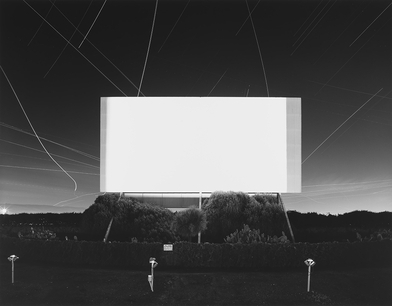 Wednesday October 12 from 7-8PM, acclaimed photographer and architect Hiroshi Sugimoto will appear in conversation with Darius Himes, International Head of Photographs at Christie’s, at the Strand Bookstore in celebration of Theaters, Sugimoto's latest collection of photographs published by Damiani and Matsumoto Editions. Signing to follow. Text by Jonathan Safron Foer. Edited with foreword by David Hrankovic. Preface by Pasquale Gagliardi. Text by Annabelle Selldorf. Introduction by Hiroshi Sugimoto. 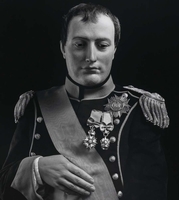 Text by Klaus Ottmann. FORMAT: Hbk, 10 x 11 in. / 176 pgs / 130 b&w.